This place is amazing, has a peaceful calming vibe to it. From water fountains to chickens and birds singing around, you get to enjoy a relaxing stay especially in the morning while having breakfast outside on the terrace/balcony. And breakfast is amazing! The owners are wonderful people. They make sure everyone is comfortable and having a nice stay. I highly recommend this place to anyone looking for a nice and affordable place in Kona. My wife and I spent a wonderful week at Hale Maluhia at Kona. Owners Ken and Sue were gracious; innkeepers Adam and Pam were always attentive and considerate. The B&B itself was clean and comfortable, truly a home away from home. We would return in a heartbeat. Our stay at Maluhia was great we liked the Jucuzi and the Homemade Bread I even got the receipe.....We will be going back in November for my Birthday!!! The most relaxing and enjoyable part of our vacation were the days we spent at Hale Maluhia. Wish we'd had more time to spend here - will be back! Very friendly & helpful staff, lavish breakfast, comfortable, clean room & exquisite grounds & facility. We came over from our home on the east side of the island to see a show at the Aloha theater & found the best place to eat nearby - Annie's at Mango Court in Kainaliu. Not cheap, but great food & value. My husband and I spent a week at Hale Maluhia Sept. 2014. We chose this place because of the reasonable/welcome price and the friendliness evident in the on-line information. We hadn't been there 24 hours before we realized this is a very special place in terms of staff, atmosphere, natural beauty, friendliness, helpfulness. I actually told my husband that if I were unable to do anything else while in Hawai'i, I would go home content because of our Hale Maluhia experience. We felt sorry for people staying in some conventional hotel room in town. This place and everyone living/working there are full of character. We felt totally at home and free to ask for anything we needed. Our shower control knob was hard to use--it was replaced very quickly, as was the shower head. The openness and accessibility of each staff member led to fascinating conversations. The breakfast scene was truly a wonderful experience--the setting rich with color and shared with lovely birds, turkeys and chickens and brilliant green lizards eager for a lick of sweet fruit. Louis, the chef, put together a beautiful breakfast spread and I loved hanging around the kitchen admiring his work. We could make omelets using an array of delicious, healthy ingredients--and Louis often made the tastiest fruit smoothies. The Kona coffee was something to look forward to each morning too. Each morning was a rich experience, one we were sad to have to leave at week's end. Hale Maluhia is much more than a B&B--it is an enriching and memorable time in itself. We would love to go there again. What a wonderful place to stay! During our 2 week travels around the Big Island of Hawaii, we were fortunate enough to find this great, affordable B&B. Ken was very accommodating to our late arrival, and the breakfast each morning was outstanding! The rooms were cozy and the beds were comfortable. The residents of the house were super helpful in giving us fun places to explore. We enjoyed our stay so much that we cancelled a different hotel reservation and stayed here again when we came back to this side of the island at the end of our trip. If we ever visit Hawaii again, we will definitely be staying at Hale Maluhia! Mahalo! A most pleasant place to stay in Hawaii. My wife and I just returned from 10 days at Hale Maluhia and couldn't be more pleased with our choice of accommodations. Our room was sunny and bright and the air conditioner kept it at a comfortable temperature, important for my wife. The daily breakfast was fabulous with a wide variety of food to chose from in the kitchen. Dining was on the comfortable lanai where you could watch birds feeding in the bird feeder and on the grass. The staff was very friendly and helpful and always upbeat. The owner, Ken, is very knowledgeable about the island and was able to suggest many interesting places to visit. The price is very good considering the wonderful breakfast provided. My wife and I will definitely stay there the next time we visit the Big Island. Peaceful Paradise near everything Kona! Let me start by saying I am soooo happy we stayed here for a week during Ironman World Championship. My husband needed a place that was quiet and comfortable and we got it here at Hale Maluhia. We stayed in the Banyan House, which is a rustic cabin with plenty of room for a couple or family. This is nature folks - so don't expect every crack and crevice of this cabin to be sparkly and new, but it is very clean. What you can expect is a comfortable couch to lay on while watching a good selection of cable or a movie from the DVD library, a VERY comfy bed, the sounds of nature putting you to sleep every night (leave the windows open - there are screens and we had no worry about mosquitoes with the colorful geckos guarding the premises). We had a large enough fridge for my husband to put his drinks and water, etc. in to prepare for Ironman, microwave, plates, and more. The bathroom is large and the shower had great pressure, which is sometimes hard to find on Kona, even in the large hotels. There was no A/C in the cabin, common on the island; but we didn't need it. I know other rooms on the property have it. Every morning, the breakfast bell lets you know it's time to come on down to the main kitchen and get fed. I loved that bell! You can make your own omelette, which had plenty of fixings. Warm, homemade bread, fruit, juice and coffee to start your day. Sitting on the porch, you have a lovely view of finches, flowers, all kinds of trees and the geckos come to greet you. I think the best part of staying here is the friendliness of the staff. Ken, Sunny, (and the Elder Ken), everyone - SO kind and thoughtful. We felt like we were visiting our family. Ken and Sunny even noticed we weren't at breakfast the day after Ironman (which my hubby finished!). They brought breakfast up to the cabin. I would definitely stay here again! Enjoy a gentle touch of aloha from old Hawai'i along the road less traveled at Hale Maluhia. A Country Inn Estate with Kona Coffee Country Comfort and Hawaiian plantation living. Big old Trees, Sage Advice, Deep stone/tile Hot Tub W/Jets, Good beds, Private baths, Breakfast Lovers Buffet with an Omelet Bar and bird watching. Broad Band Wireless "N", Cable, TV/DVD's Exceptional Free DVD Movie Library. Christian Book Library, Comfortable, Private, Secluded Gracious Living. Be sure to view our "Virtual Tour." 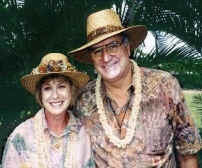 www.hawaii-bnb.com 3 miles to the Kailua Kona Pier and 11 miles to the Kona International Airport, (KOA).